[The following comes from "The Hearth and Its Implements," the third chapter of Gertrude Jekyll's Old English Household Life (1925), some of the material of which previously appeared in her 1904 volume, Old West Surrey. The photographs and drawings are probably all hers. GPL scanned and formatted text and images, added headings, and cut and rearranged some portions of the text, moving, for example, the section on cooking pots earlier in the text here than in the original.]. WHEN wood was the only fuel, except peat, in country districts, the wide "down" hearth was commonly used both for cooking and warming. It was equally suitable where, in some remote moorland places, there was no true peat for the alternative fuel — parings of peaty soils containing tufts of heath and gorse. In the simplest cottages the usual cooking utensil was the three-legged iron pot. It could either stand in the hot ashes on its three short legs or hang by the swinging handle, the chimney was the wooden chimney bar, stretching across, the ends let into the masonry. It was of oak, or preferably, of chestnut; in section higher than wide and with the upper edge rounded. Over this passed the curved top end of the hanger, an iron bar with a flat sheet-iron ratchet attachment looking like a coarse saw. The lowest end of the upright had either a closed loop or a knob, from which hung the hook that caught one of the teeth of the ratchet. The hanger could thus be set either high or low, according to the liveliness of the fire or the degree of heat required for the cooking. The most primitive form of hanger was the wooden "crochan," by which the pot, slung from above by a hazel rope, hung over the fire (at right). Some of the older hangers have an ornament at the top, usually a fleur-de-lys, or it might be a kind of lance head, or only a close curl of the end of the iron that connected the upper part of the ratchet with the upright bar (see "A" below). A rare example of a highly ornamented hanger is in the Victoria and Albert Museum. The loop that catches in the ratchet is decorated with elaborate scroll work and the lower part is pierced through, showing a silhouette of the smith at work, with some of his tools above ("C" below). In farms and the better class of houses something more than the simple hanger was wanted. The fire was large and wide spread so that one point or another of its area might be the more convenient place for the cooking pot. Some contrivance for meeting this alternative was by the chimney crane or pot crane; this was of two forms, one in which the horizontal bar was simply supported by a diagonal stay and the height of the pot adjusted by a short hanger at any point along the bar, and the other in which there are two movements of the crane itself; one to swing forward and back, and the other for raising or lowering the hook that holds the pot or kettle. In both forms the main vertical iron, the backbone of the whole concern, is so held at top and bottom that it can swing forward like a gate. The bottom end is commonly fitted into a piece of hard stone and the top into a loop in an iron cramp built into the wall. At a certain distance along the horizontal arm a short iron strap suspends a lever or handle that has a hanging hook at the fire end, while the handle end rests under any one of the projecting buttons on the quadrant that is fixed near the upright, and thus the pot is held at any height above the fire. These cranes, made during the seventeenth and eighteenth centuries, show a great diversity of ornament. The main part of the structure was determined by the necessities of its use, and the smith then exercised his own powers of invention, taste and skill in various methods of enrichment. Sometimes it is only in the line or play of the different straps and stays; which, after doing their constructional work, were drawn out into curls or volutes with more or less closed ends, or it may be some ornamental twists of the square sectioned iron bar, or a little spray of leaf and flower, or even a whole tree with leafy branches and scroll tendrils. Left: Cottage Fire-dogs. Right: Cup-dog for warming drinks. 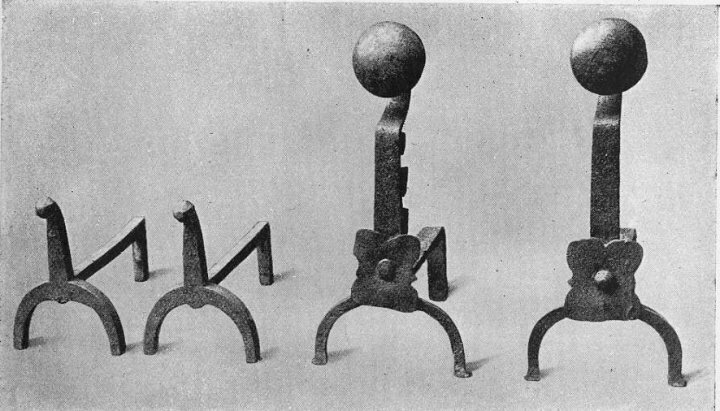 A simple form of iron firedog was in use in every cottage, generally of low shape so as not to interfere with the swinging pot; the upright front being only high enough to stop a log of reasonable thickness from rolling out forwards; and there were two loose iron bars that could be adjusted on the dogs so as to hold a cooking pot. But in some farmhouses, and even cottages, there were the tall-fronted cup dogs, with the tops framed in such a way as to hold a mug of hot drink. In these and in many other forms of tall-fronted dogs there was often an arrangement for supporting a spit. The illustration of the basket or cardle sspit immediately above shows one with movable loops; these would bring the spit to the front of the dogs. The loops or hooks were more frequently and more conveniently fixed to the back of the dogs, nearer to the fire. It was the pride of the good housewife to keep her spits bright, and they showed finely when displayed in the spitrack over the front of the fireplace. These spitracks were sometimes quite plain, but usually with the fronts of tlie projections handsomely moulded. Sometimes the spit was worked by a smoke-jack, a piece of mechanism whose power was derived from the draught in the chimney. In this case the spit had a circular disk at one end, the edge grooved to take the chain that connected it with the jack. In some old spits this circular wheel was larger, pointing to its having been used in the older days when turnspit dogs were the motive power. From the spit, a chain or cord was conveyed to the dog wheel fixed at some convenient height against the wall of the kitchen. The dog worked inside the wheel, whose flooring had transverse battens for his foothold. They were small, short legged, long bodied dogs, something the shape of a dachshund. Nowadays we roast more conveniently by hanging the joint vertically to the clockwork jack ; this also is better suited to the narrow shape of our coal fires. But in the old days, when the fire was on the hearth and was large and wide shaped to take a large piece of meat, there was no other way of roasting than the horizontal. For a heavy piece of meat there were two usual forms of spit; one with two prongs which held it firm and the other, called a basket or cradle spit, in which the meat was enclosed, and held by a number of thin iron bars (see below). This was specially convenient for cooking a tender viand like a sucking pig, in whose case it was desirable to avoid piercing the meat and so letting out the succulent juices. Left: Basket or Cradle Spit. Right: Pronged Roasting Spit. Note the pulleys at the left of each, which orginally connected to a smoke jack, a mechansm that rotated the cooking meat — an early version of a rotisserie. Many a pair of handsome old firedogs that had been in manorial houses found their way into farmhouses and cottages when iron firegrates came into use in the kitchens of houses of the better class. Some of them, of pure Gothic design, are of great antiquity. They might often be found fifty years ago in Surrey and Sussex, when attendance at farm sales in remote country places gave an opportunity of collecting many interesting relics of the older days. The main cooking utensil was the iron pot, still made and now largely exported to some half-barbarous peoples. It would either swing from the hook of a hanger or stand down in the ashes. There were also skillets of brass or bronze which appear to have been cast in one piece. They were thick and heavy and look as if they would wear and endure for ever. In fact, a great many more of these would have been still in existence but that in Jacobean times a quantity were called in and melted down for bronze coinage. A later form of skillet was of wrought brass, much thinner. 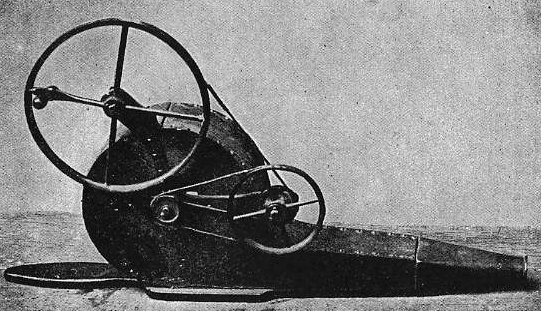 This kind had a projecting rim, the brass being brought over a wired edge, and they dropped into iron holders on three legs. Large brass cauldrons were used for heating milk in cheesemaking. Iron trivets, on which any cooking pot could be stood, or anything placed to keep warm, were in many good patterns. 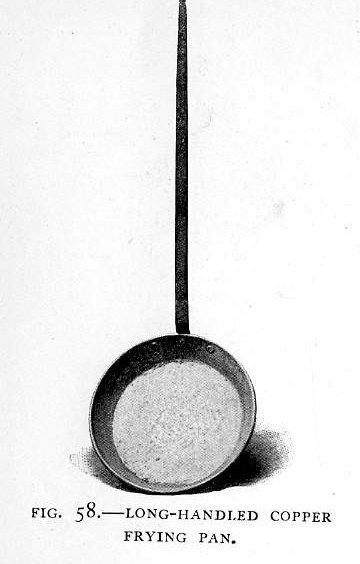 Frying pans had the handles very long, sometimes as much as three and half feet; the necessity of this will be seen when the size of the wood fire and the distance for the comfort of the operator are considered. Various skillets. This kind of cookware has legs to raise it above the floor of the fireplace and coals. There were also earthen cooking pots ; pipkins with handles, in stoneware with a dull glaze, both inside and out, and in different kinds of earthenware; some all glazed, and others, of the commonest kind, of the ordinary redware, glazed inside only. They were used either seated in the hot ashes or raised on trivets. Cakes and small loaves were baked in the ashes under a redware pot turned upside down. The girdle, still much used in the north and occasionally all over England, is of great antiquity; it can either hang to a hanger or stand on a trivet. Pipkins in stoneware and glazed earthenware.. The tongs and fire shovels of the older times were of a fine simple shape, in happy contrast to the implements of the same name now to be found in shops, for the most part of bad design or overloaded with useless, so-called ornament. 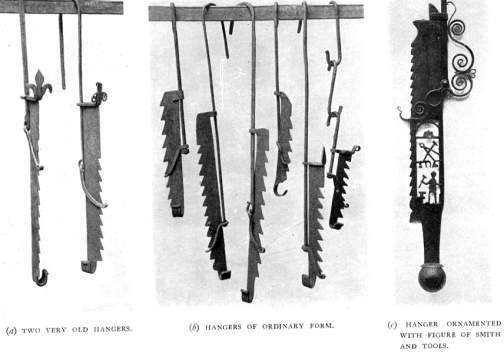 The reason is not far to seek, for the old tongs were made for actual use by the nearest smith, while the modern thing is one of thousands of the same, out of the ironmonger's pattern book. Really beautiful were some of the old brand tongs, small things to be held in one hand for picking up a brand and blowing it into flame for lighting a pipe or a rushlight. Several forms of toasting implements were in use with the down fire; some quite low for the cottage for toasting bacon or bread. They stood on three short legs — two of them forward, under the actual toaster, and one half-way back, under the handle. The head with its two hoops was on a loose rivet and could be twisted a little way to one side or the other. The implement that is shown with the toaster is for raking hot potatoes out of the ashes. 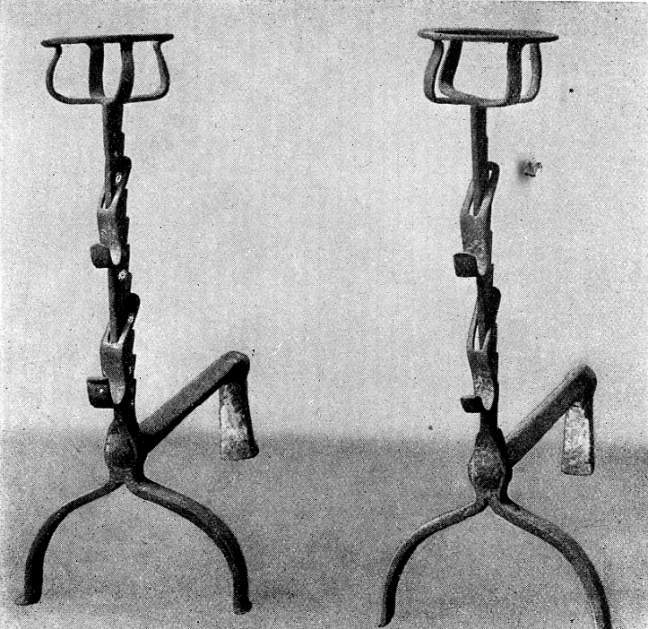 There were larger and more elaborate toasters in better houses, with tripod legs supporting an upright to which the actual toasting I'ork was fixed. In both the examples shown in Fig. 56 the toasting part slides up and down the standard and also revolves upon it, while it is kept in uny position that may be desired by the pressure of a spring. In the one on the right hand there is another movement, for the horizontal fork pulls backward and forward. Right: A Tea kettle hanging on an Idleback attached to an adjustable metal hanger. A favourite device for tipping a kettle without taking it off the fire was the idleback or lazyback (Figs. 61-2). It hung on the hanger and it will be seen from tlie illustration how the act of pulling down the handle will tip the kettle. The hook nearest the spout has a spring clip that keeps the front of the kettle handle down when it is tipped for pouring. The old smith who forged it could not resist the suggestion of snake-like form in the handle of the tipper, for he finished off the end in a little snake's head. If it is noticed that in the picture the kettle does not hang level, it is because it is the way it takes of itself after being tipped. A piece of old waggon tire, stood on edge, was commonly used in cottages as a fender, and a very handy fender it makes; standing four inches high and about twenty inches long and with a pleasant curve, it was a neat way of keeping the ashes of the front of the fire in place. 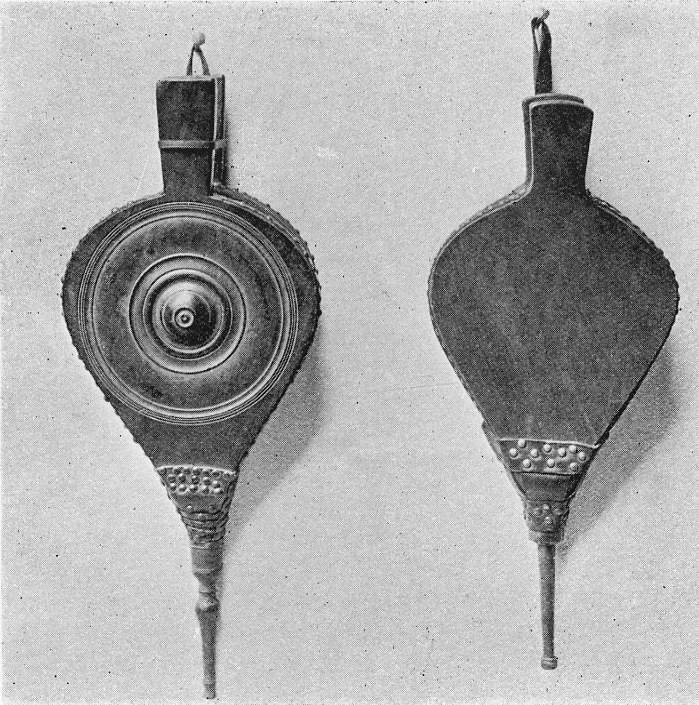 Bellows have been in use for all time, but from their construction of wood and leather and from the need of their constant employment they had necessarily a rather short lifetime, and examples of those in common use dating further back than a hundred and fifty years are rare, though there are much older specimens in museums of a highly ornamental kind, in which both wooden faces were richly carved. The oldest we know of for ordinary household use had much longer handles and shorter bodies than the later patterns. A good kind of the late eighteenth and early nineteenth centuries had the turned body of a. dark hardwood, as shown in one of the examples illustrated. This had a nicely formed brass nozzle, and was altogether a shapely article. The ordinary kitchen bellows with elm body that is still to be had follows this, though on coarser lines. 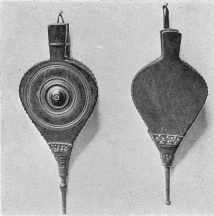 An ingenious form of bellows, giving a continuous blast, was in use in the early years of the nineteenth century. It has a drum-shaped body narrowing into a square channel that ends in a brass nozzle. Inside the drum is a wheel with floats. Outside there is an arrangement of two wheels with driving bands, the larger with a handle, which turn the wheel within, the multiplied power making a steady draught. There is an old saying among cottage folk in Sussex descriptive of some situation that is full of difficulty or almost hopeless: "It is a case of green wood and no bellows." Jekyll, Gertrude Old English Household Life: Some Account of Cottage Objects and Country Folk. London: B. T. Batsford, 1925. Jekyll, Gertrude Old West Surrey: Some Notes and Memories. London: Longmans, Green, & Co, 1904.